The LifeSize Room 220 is a Full HD video conferencing solution designed for collaboration between up to eight total participants in any size meeting room. The most active four speakers can be displayed at any one time, or you may choose to focus on one primary speaker. The Room 220 features options for a dual or third camera and can support dual displays so you can view different room angles with one switch and view data on one display while seeing the participants on other display. Because the LifeSize Room 220 can connect to additional video devices, you are able to use it in any working environment. The LifeSize Room 220 makes it feel like being there, whether you’re in a small office or a large conference room. 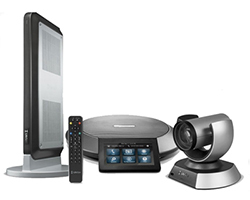 When paired with the LifeSize Phone 2nd Generation, codec and Camera 10X, the Room 220 becomes a powerful full-featured HD video conferencing solution.